Many conjectures have been made concerning the monumental complex of Giza. Some of these fall within the theories of the so called “independent school of Egyptology”, of which they constitute a great part. It is undeniable that “academic” Egyptology has greatly contributed to our knowledge of a unique and incomparable civilization, incredibly developed socially, artistically and scientifically. Unfortunately, academic Egyptologists have also persisted in misattributing some archaeological finds to Dynastic Egyptians, which I believe have little to do with that civilization. This has created confusion among researchers and has affected our comprehension of the prehistory of Egypt. In the last 20 years, one of the most outstanding theories, in scientific terms, is that proposed by Robert Bauval, known as The Orion Correlation Theory. He proposed a correlation between the major pyramids of Giza and the three largest stars forming the Belt of Orion. Particularly, he suggested that a perfect alignment between the former and the latter occurred in the year 10,450 BC. As a result of this, a fervid debate among scholars originated, which has long slowed, and at times even impeded, objective analysis of the pyramid complex. Ahmed Osman, Armando Mei, Robert Bauval and John Major Jenkins. Still mysteries remain, for example, the dispute over the “Zep Tepi” (‘First Time’ or Golden Era). While academics agree to confine its purpose to mythology, I believe that their position conflicts with the long lists of sovereigns found so accurately transcribed in Egyptian documents and temples. I do not believe that the First Time is a myth, as it is regarded by some researchers. I assume that the Zep Tepi was an historical time of prosperity. In my opinion, all major monuments of Giza were built before the Dynastic Age to celebrate the Age of Osiris rule. But, when were the monuments of Giza built? I studied the astronomical configuration of the sky above Giza in the remote past. First of all, I analyzed the astronomical configuration concerning the sky above Giza in the year 10,450 BC (Bauval’s Theory). Bauval’s Orion Correlation Theory – Vernal Equinox 10,500 BC. Al Nitak is not on the Meridian and not connected to the Great Pyramid. Sirius is under the Horizon. Planets have not a symbolic arrangement. At the dawn of the vernal equinox, the Constellation of Lion is right on the ecliptic, while the Constellation of Orion is on the Meridian. Remarkable is the position of Mintaka, because this star lies on the Meridian while Alnitak has moved toward the south-east. In my opinion, this is not the right configuration, because I would expect to find Alnitak (the correspondent of the Great Pyramid, the most important monument of Giza) on the Meridian and not the pyramid of Mycerinus, the smaller pyramid of Giza. Any other astronomical object, close to the monuments of Giza, were in the Sky at that time. At the dawn of the vernal equinox. The Lion constellation and Sphinx are closely connected to the East. The Orion constellation is on the Celestial Meridian, exactly above the Pyramids. Most importantly, it’s a perfect connection between Al Nitak – the largest Star of the Belt of Orion – and the Great Pyramid , the biggest monument in the Giza Plateau. The connection occurred only in this astronomical configuration and in no one astronomical alignment ever proposed by experts, from 2,000 AD to 100,000 BC. As Al Nitak cuts the Celestial Meridian, so the Great Pyramid lies in the center of emerged lands, the main meridian and parallel intersection, or rather at the distance of 1/3 between the Equator and North Pole, symbolizing the “natural zero” for longitude. Moreover, there are many astronomical guidelines proving the concept of the Beginning of a New Age. First of all, the planets positions. They are positioned in the south-east hemisphere, as though following the rising Sun through its movement along the ecliptic. In particular, the Moon is a New Moon, and it’s positioned just below the celestial horizon, ready to follow the Sun’s movement towards the light. The seven planets are positioned along the ecliptic in a perfect row, fixing the beginning of the New Era. Just below the ecliptic, the New Moon gives way to Sunrise – the rebirth of the New Light – that will flood the Land of Egypt, bringing lifeblood for new crops. In a few moments, the Moon will follow the god Sun-Ra, through its astronomical move; while all courtiers-planets, waiting for him, will be darkened by its vitality. In its rising path, the Sun-Ra will have its first stop at the foot of the Lion Constellation-Sphinx, where it will meet Jupiter-Temple of Valley; Jupiter symbolizes the Father of the Gods, and it’s an expressive symbol of Justice. Sun-Ra then meets Mercury-Temple of the Sphinx, the Messenger of the Gods, ready to accomplish its function: give forth the Beginning of the Zep Tepi. The arrangement of two planets, in conjunction with the star Regulus, has an amazing meaning. 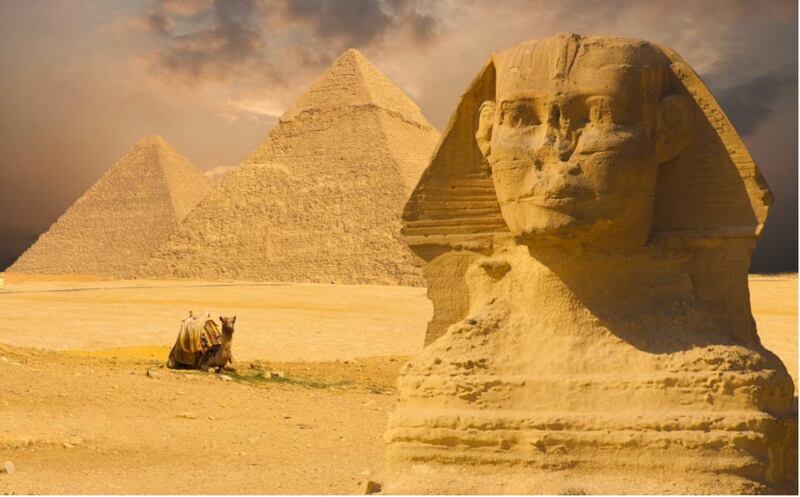 If we take a look at the Sphinx, there are two temples at its feet; the buildings, characterized by colossal and mysterious columns, were built at the same time as the Pyramids and represent Jupiter and Mercury. In his climbing path, that will lead it to the Zenith, Sun-Ra meets Venus, symbolizing Love, Passion and Beauty. The planet is located in the south-east quadrant, almost half way from the Zenith. It is not an accidental position, and also it is the astronomical connection that gave birth to the original symbolic meaning of “unity of Opposite. An “astronomical wedding” takes place between different cosmic objects – a planet and a star – before walking together to the sunset. Lastly, the Sun meets Mars, the red planet, symbolizing Power. It is time to establish the Rule over the Universe, sitting on the throne of the Sky, so as for Osiris when he ruled over the Land of Egypt, starting the Age of the Zep Tepi. Now, the Sun-Ra is at the Zenith. Everything has been accomplished according to the Laws of Astronomy. Passing the Zenith, the Sun-Ra goes through the ecliptic, in the south-west quadrant, where Saturn is waiting. Observing the astronomical map, a curious detail strikes: all planets, whose names are associated with the days of the week, are on the ecliptic. It is very intriguing to note that the planet of rest, Saturn-Saturday, is located exactly in the south-west quadrant, the place of death for Ancient Egyptians. The disposition of Saturn is very fascinating. In Hebrew traditions, they consider Saturday as the day of rest, dedicating it for celebrating the Lord. It means that Hebrew Traditions could have been influenced by memories of Zep Tepi. Ancient Texts of Pyramids told us about connections between the Star Sirius and the Goddess Isis. She played a great role after the death of Osiris, at the climax of the Zep Tepi. So, when Giza was projected, the builders gave her a key role; they built a monument to celebrate the goddess who preserved Egypt. The monument is located south-east of the Sphinx, known as the Tomb of Khentkhaus. 2) Star Sirius position in the sky above Giza in the year 36,400 BC. 3) proportional connections between physical values of the Star and dimensions of the Monument. Correct interpretation of Inventory Stele hieroglyphs is essential to explain where her monument was built. The hieroglyph, shown below, is the key to the mystery. Academics have misunderstood the meaning of the phrase. The hieroglyph comes into the sentence twice… first, it means “beside”, and second it means “near”. Egyptologists have translated it only once, making a remarkable mistake in translation.. So, according to the Inventory Stele there is a monument beside the Pyramid near the Sphinx. But where? Take a look at the Astronomical Map. Sirius is just above the horizon between the Lion and Orion constellations. Khentkhaus’ tomb proportions are very close to some Sirius physical parameters, for example: Tomb height is 10mt. ; in Egyptian cubits is: 22.37. Sirius brightness is 22.40. (Difference -0,03); Area of the Tomb is: 2083.9 square meters. Sirius Mass is 1/1000 of this value: 2,15 (Difference -0,067); Tomb Perimeter is: 182.6 mt. Sirius Radius is 1/100 of this value: 1.88 (Difference -0.054);. Sirius Angular Separation from East is: 67°59’22”; Khentkhaus Tomb position from East is: 67°32’00”, a difference of 0°27’22”. In conclusion, the lower part of the Khentkhaus tomb is the Ancient Throne of Isis! That’s the hermetic message that the Lost Civilization of Giza wanted to convey. In the Age of Lion, preceding the perfect alignment that Bauval suggested, an extraordinary event took place. This event marked the climax of an amazingly developed civilization, that managed to colonize emerged lands and whose fingerprints have resisted the passing of time, but who wished to leave a record of their presence on Earth.